Set to revolutionise large-scale presentations, Epson’s latest 3LCD-powered, high-definition series achieves excellent gradation, smooth colour change and superlative cinema-like quality that bring images to life. Epson’s new series offers WUXGA resolution, featuring superb resolution images and high-definition videos. Even on large screens, images remain razor sharp and vivid. Differences in brightness can result in loss of detail, especially with quick cuts between dark and light scenes. Epson’s new ultra smooth auto iris, with a contrast ratio of 5,000:1, monitoring the intrinsic brightness level of each scene and automatically adjusting to the optimal level (even with rapid switching between light and dark scenes). Brilliant scenes are crisp and clear, while dark scenes retain all the details of the original photo. This projector features Faroudja DCDi® (Directional Correlational Deinterlacing) Cinema chipset, a video enhancement technology that produces an exceptional image quality without introducing artifacts. Faroudja DCDi was developed to eliminate jagginess using a unique algorithm. This technology, in combination with decoding, deinterlacing and enhancement technologies, won an Emmy Award from the National Academy of Television Arts and Sciences in the USA in 2001. The Epson Cinema Filter extracts very pure hues of the three primary colour gamut, enabling unbeatable colour reproduction and quality while maintaining high contrast ratios. So you enjoy the same range of colours as those of digital cinema. Now, you can enjoy clearer, sharper playback with Epson’s Frame Interpolation Technology. This feature effectively eliminates motion blurring by inserting new frames between original ones to create smoother motion transition. The super resolution technology reveals details that other projectors can’t, allowing you to enjoy high definition quality on large screens even from low resolution videos. This feature helps you seamlessly project multiple images using two or more projections together for bigger, more compelling presentations. The edge-blending attribute lets you control brightness at the crossover edge to create a panoramic image. 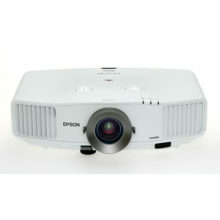 It also has multi-screen colour adjustment, so fine brightness and colour adjustments can be made for each projector. Now you can correct single-projector distortion or multiple-projector misalignment on the screen. With the point correction feature, you can quickly fine-tune the images, adjusting point by point from right to left, up and down, using a projected 9 × 9 matrix at a minimum. Adaptability to a wide range of devices means that this projector series is compatible with any setting. 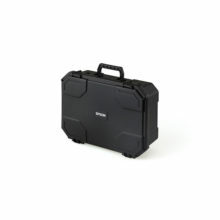 Its advanced connectivity features make it simple to incorporate additional technology as you upgrade your system. And with two HDMI ports, you get high-quality image projection. Split screen allows inputs from two separate sources to be displayed side by side on the same screen for a more effective presentation. In video conferences, images of presentation materials and remote participants can be shown simultaneously. This function makes it easy to quickly and precisely correct any vertical or horizontal distortion of the projected image. Enjoy the ease and versatility of projector and screen placement with Epson’s lens shift feature. It has a maximum vertical lens shift of 70% and a maximum horizontal lens shift of 20%, allowing the user to have the flexibility in projector and screen placements. With Epson’s Network monitoring and control software, you can see from a single PC which projectors are available and whether they are running efficiently – even across the biggest network. You can configure your projectors and access their serial numbers remotely, as well as receive instant mail alerts for pre-defined critical indicators such as on-functioning devices or overheating lamps. 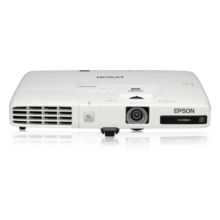 With Epson’s proprietary C2Fine™ (Crystal Clear Fine) Technology and inorganic LCD panels with its Original Cooling system, these projectors can withstand temperatures up to 55°C while preserving brightness and picture quality. 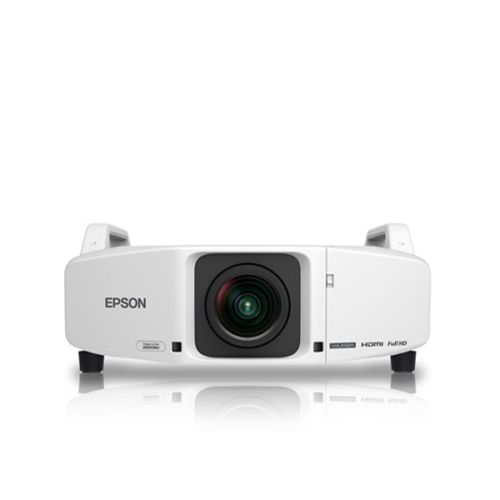 It also operates on low noise, making the use of projector unobtrusive in meeting rooms and lecture halls.